Find hotel near The Water Palace Tirta Ga .. If you wish to witness the royal legacy of Bali, this the best place for it! The former royal palace is located in the eastern Bali and lies about 5 km away from Karangasem. The place is home to the popular water palace built in 1946 and governed by Karangasem royals. Roughly called as the water from the Ganges, it is a beautiful place where the Hindu crowd of the city comes to show their reverence. Walking around, you will find a maze of pools and fountains sprawled across the area. The lush greenery of the place is further accentuated by stone statues and carvings that adorn the place. It is one-hectare wide complex hence ensure to take some time from your schedule to explore the place fully as it is every bit worth it. Home to bountiful attractions like Tanah Lot Temple, Tirta Empul, Mount Agung, Mount Batur and Bali Bird Park, there are many things to do in Bali that you can explore on your visit. A fun-filled day in the city is possible with these exciting Bali tours that you can book for your visit. Book perfect hotels in Bali like Gatra Ubud Inn, The Peacock Inn, Kampoeng Joglo Abangan and Bije Sari Suite Bisma. Choose from variety of exclusive Bali vacation packages for your next visit or create own own. Check out the various options for how to reach Bali and finish off your vacation package by booking the ideal transfer. Wear modest clothing to enter the Balinese temple. Cover the middle section with a scarf. Entrance ticket can be bought at the office in front of the garden. If the office is close, one can buy tickets from the guard inside. How popular is The Water Palace Tirta Gangga? People normally club together Puri Agung Karangasem and Pura Lempuyang while planning their visit to The Water Palace Tirta Gangga. I just loved visiting Karangasem. There are some beautiful place, and this place is the great one. The humble of the people, the green and clean place make me feel that I should come again. I loved feeding the fish, watching children swimming there, it just so funny and natural. I also loved to take some pictures here. You will have a beautiful photo and object, I am sure. 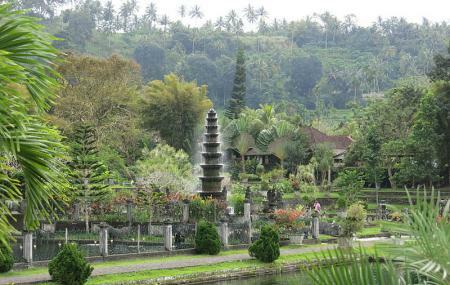 A garden or park in Balinese style. Social media create a modish and it turned out to became tourism spot. If you are here to dine in the restaurant, it offer great view and I would not complain to enjoy the foods here with the love one. Well for sightseeing, honestly there were more attractive park in some other countries with rich cultures and history. My honest comment is if you are looking for something cultural, not here! If you love beautiful photography, yes you must come here if you visit Bali. A very clean and calm place, though u can see a lot of travellers this place is too calm and serene, the entry fee is 20000IDR per head and it's worth the spend. You can carry fish food and feed the fishes in the pond and great place for some good pictures. You can walk on the stones which makes u feel like hopping on the water. We had hired a bike to this place and the ride/ drive to this place is good where u get to see the active volcano from a distance and the view is just majestic. It’s so so beautiful here. Make sure you buy some fish food on the way in at one of the little sellers. If you feed the fish they will gather all around and you’ll get beautiful photos with them. They are huge! Very well fed little koi fish.